At the Same Day Courier Network we have taken every care to ensure the system is simple, fast and intuitive for our members. 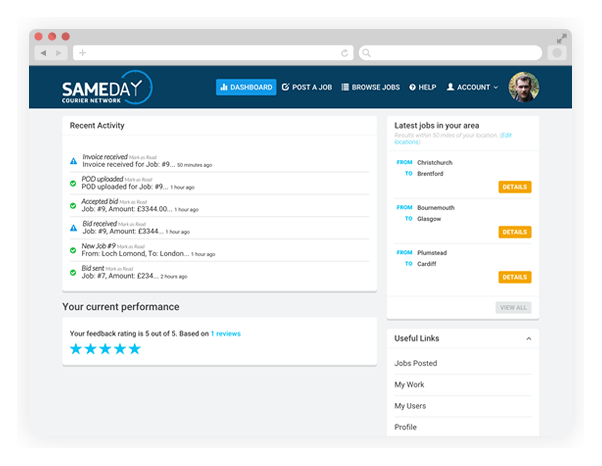 As a trading platform for couriers and hauliers we want you to be able post jobs, bid for work and upload your PODs in seconds, as well as raising invoices with just the click of a mouse. We believe we have built the best and easiest platform to use, which looks great and costs a fraction of the price of our competitors, in fact our goal is to ensure our members subscription fees will always be the fairest price out there, whilst offering a great site, backed up with an excellent service. With ease of use as well as value for money being our highest priorities, we are proud with what we have achieved, especially with the making bids section of the site. 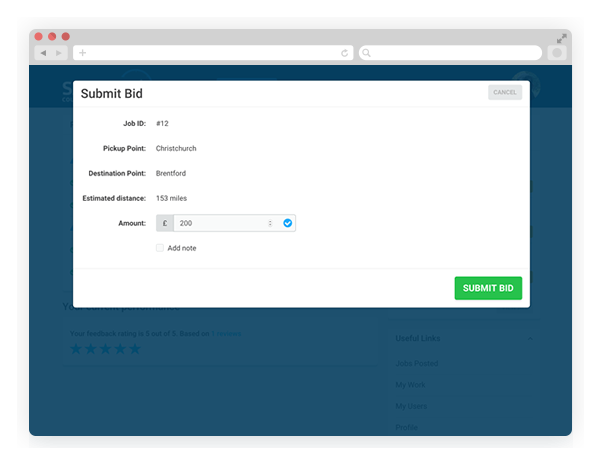 Being a mobile ready site you can make a bid on any device, at any time, anywhere. By simply entering your price and typing any notes you may wish to, and simply clicking on the “Place Bid” tab. You are guaranteed your bid will be seen before the company assign the work, but of course the option to call is always available as well. Once you have uploaded the POD on the system you can raise your invoice with one click of the mouse which will forward the invoice to both yourself, and the company/owner driver who you carried the out the work for, automatically producing a unique invoice number. 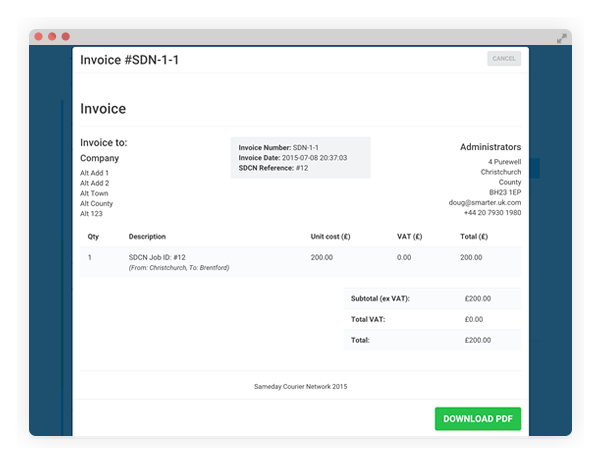 If you have agreed any further charges such as waiting time or extra mileage, it could not be simpler to add these before producing the invoice, just a click and quick tap of the keyboard and this done. Further still this can be done immediately from any device, any time, anywhere so no more waiting to return to the office before invoices can raised. The Sameday Courier Network is a trading platform for the transport industry. Members can place loads, search for loads and offer their price to move loads. This has been developed by transport professionals for the transport industry using the latest technology; our aim is to be the no. 1 choice for couriers and hauliers due to the simplicity and accessibility of the mobile ready website, offering the best platform at the best value for money and a personal customer service 24/7 to mirror the transport industry. 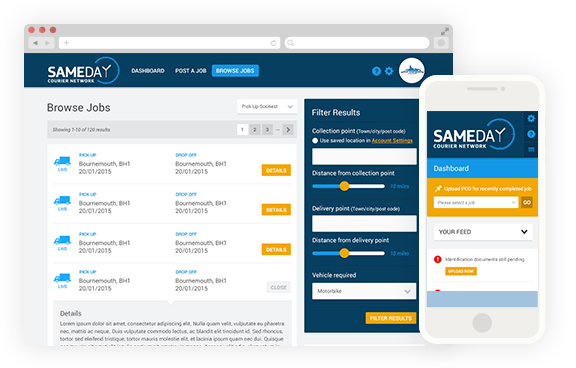 The Sameday Courier Network Ltd is a trading platform providing a solution for the transport industry using mobile ready technology, with the company aiming to provide the best possible customer service to its members. All our staff have been involved in the transport and logistics industry for many years and have a wealth of experience. Our aim is to provide the simplest most intuitive platform for the best value and to be the no.1 platform for couriers and hauliers.